Willing Hosts | Mothers Against Wind Turbines Inc.
With Royal Assent received Wednesday for Bill 2, Urgent Priorities Act 2018, wpd’s nine industrial wind turbine project in Prince Edward County is terminated. Smith told thte legislature the company has been building non-stop since the middle of June, even after the government announced its intentions to legislatively terminate the project on July 10. The act, retroactive to July 10, terminates permits and revokes approvals, including the Feed-in-Tarriff contract and Renewable Energy Approval issued in July 2015. It requires decommissioning and to “maintain the lands in a clean and safe condition”. Smith said it’s been seven long years, but he’s glad to be able to have accomplished this feat. Kincardine Council asked the MOECC(Ministry of the Environment & Climate Change) on December 6, 2017 what is being done about continued noise reports at the Enbridge wind power project for the past NINE YEARS! MOECC District Manager documents the history of incomplete reports, and reported health effects. The date is September 28, 2008 newly minted Ontario Minister of Energy and Infrastructure George Smitherman gushes over a vision of the future for green-energy in Ontario. In 2009 the Green Energy Act passes and is rapidly followed by 1 000s upon 1000s of industrial wind turbines erected. Ontario bowed to political push back by pausing installation of wind turbines in the Great Lakes. Today an offshore demonstration project looms with a build date of 2018. The project proposed in Lake Erie off Ohio’s shores. From visions of green energy to build out of wind projects. What do you see? NIAGARA FALLS–In just nine weeks George Smitherman has likely learned more about the green-energy industry than any energy minister before him, and then some. Sitting in a meeting room at the Sheraton Fallsview Hotel in Niagara Falls, just minutes after giving his first major speech since being appointed energy and infrastructure minister in June, Smitherman enthuses like a kid who has just returned from Euro Disney. He recounts his visit to a small community in Denmark that powers and heats itself with straw, municipal waste and geothermal energy. Then there was the neighbourhood in Freiburg, Germany, powered by rooftop solar panels atop high-efficiency homes. In Spain, he saw how the local electricity operator manages the country’s 15,000 megawatts of wind turbines and a world-class stable of solar farms. His travels also took him to California, where he learned how the world’s fifth-largest economy used innovative conservation programs and energy-efficiency mandates to keep per-capita electricity consumption flat for the last three decades. The trips didn’t end there. On his home turf, he has already visited the massive Prince Wind Farm in Sault St. Marie, the Atikokan coal-fired generating station near Thunder Bay, the province’s three nuclear power stations, the massive Nanticoke coal-fired station, Hydro One’s grid control centre in Barrie, and has been inside the Niagara Falls water tunnel currently being excavated by Big Becky. Smitherman says he’s “jazzed” about his new job, a fresh change after five years as health minister. Premier Dalton McGuinty made it a promotion, insiders say, by merging the energy and infrastructure portfolios into a super-ministry. Don’t Shove Wind Turbines Down Our Throats! The Mayor of Prince Edward County is going to this week’s conference of the Association of Municipalities of Ontario with a focus that won’t be surprising to those who follow the goings on in The County. provincial government that regulations must change with regards to big industrial wind turbines. …as a Member but first, some background. In March, 2014 CCSAGE incorporated as a not-for-profit corporation. The objectives of our group remain the same: we advocate for green energy projects when they are safe and appropriate, and challenge them otherwise. The proposed wind factories in South Marysburgh and Athol are neither green nor appropriate, and our group strenuously opposes them by initiatives of our own and by supporting the activities of PECFN and APPEC. As an example of a green initiative that we would support, Ontario is considering the establishment a long-term power purchase agreement with Quebec. This is an excellent idea, because Quebec generates almost all of its electricity (95%+) from hydro-electric facilities, perhaps the greenest of all sources. CCSAGE now has a Board of Directors, a Steering Committee and thousands of supporters who have become engaged in some way in challenging proposed wind projects in the County . The current Board is made up of Anne Dumbrille (Chair), Karen Empringham (Vice-Chair) and Garth Manning (Secretary). The number of Directors can be increased as necessary. Now, with incorporation, we are creating a Membership category, and would like to enroll our more engaged supporters as Members. As you have shown significant interest in CCSAGE and its objectives in the past, we invite you to join as a Member. What’s involved? First, there is the formal aspect: approve the actions of the Board, the corporate accounts and any bylaw changes at an annual general meeting. But more importantly, the Board intends to utilize the Membership as a focus group to preview plans, as a source of new ideas, and as invited participants in occasional CCSAGE projects. As a Member, you’ll receive regular, Members-only, email communications from the Board, and have the opportunity to provide your opinions and ideas direct to the Board. Individual Memberships are offered at $20 for the first fiscal year, which will include a free “Naturally Green” lawn sign and a “Not a Willing Host” sticker. To join, send a cheque, made out to “CCSAGE Naturally Green”, to Garth Manning, 17203 Loyalist Parkway, Wellington, ON K0K 3L0. Make sure to include your name, postal address, phone number and e-mail address (all are required). With your involvement as a Member, CCSAGE Naturally Green will become even more relevant, responsive and effective. 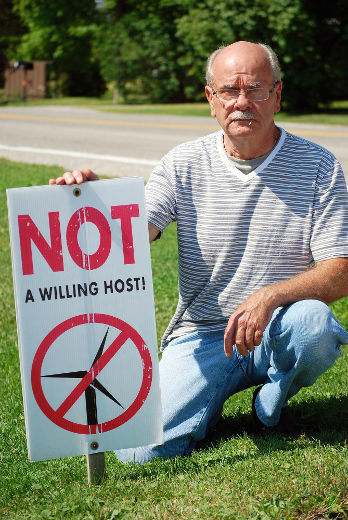 Time to Turn the Tables on Wind Proponents who Accuse Opponents of ‘Nimbyism’. It’s astounding to read these days how pleased with themselves liberals are that the Wynne Ont gov’t is remaining steadfast in their refusal to amend the Green Energy Act in any meaningful way. It’s as easy as water off a ducks back for these progressives to delight in calling opponents to Industrial Wind Turbines as NIMBY’s and having democracy essentially waived to accomplish the policy goals backed by the GEA. Take your worst nightmare of a conservative leader. An amalgam of the very worst of Harper. Harris, throw in a little Ralph Klein and some Tea Party Timmy Hudak. I can sense your blood pressure rising as I write this. Oh the horror. Premier Wynne, Please tell Rural Ontario AGAIN how its Residents have a say in Turbine Projects.